If you are self-employed, you must file your business tax return along with your personal tax return each year. To do this you must add-on the Schedule C for your small business and include the details on your personal 1040. Schedule C is used to calculate the amount of net income for a small business. The 1040 already accounts for any W2 income and taxes withheld. Part I–Income: This is information about your business income. Part II–Expenses: This is a listing of your business expenses. 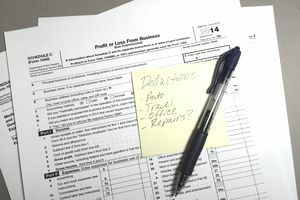 Check out this article on business tax deductions from A to Z to make sure you don't miss any. Part III–Cost of Goods Sold: This requires you to provide information about your inventory valuation method as well as inventory details for the beginning and end of the year. Part IV–Information on Your Vehicle: This requires information about any vehicles you use in your business. In this section, you may also need to file a Form 4562. Part V–Other Expenses: This is where you can include any other expenses not discussed in Part II. You may be eligible for an additional 20% tax cut on your net business income, in addition to other business expense deductions. This article from the IRS discusses the details of this deduction. You may be able to deduct more of the expense of buying equipment and business vehicles in the first year you own and use these assets. If you have employees, you may be able to get a business tax credit for providing them with family leave benefits (through 2019). On the downside, entertainment expenses are no longer deductible. In addition, some meal expenses for employees may not be deductible and deductibility for others is reduced. Here are five steps to filing your small business tax return. Schedule C: You will need Schedule C to calculate business income. Schedule SE: You will need Schedule SE to calculate self-employment tax. Form 8829: If you have a home-based business, you may also need to prepare a Form 8829 to calculate the home-based business space deduction. In some cases, you may want to use the simplified method. Form 4562: This form requires details pertaining to your vehicle. You can download and print these income tax forms from the IRS’s website along with instructions. Your Schedule C is part of your personal tax return on Form 1040, so you may want to use business tax software. Be sure the software you are using includes Schedule C.
Both Schedule C and Schedule SE are "fillable" forms. That is, you can complete them online, save a copy, and print out the copy. Be sure to save the copy where you can find it if you have to make changes. You can also use my instructions for a simple version of both Schedule C and Schedule SE. Even if you are using software, you might want to do a trial run with Schedule C using the fillable form, so you can see how to categorize your business income and expenses. This is most important because you want to capture all of the expenses on Schedule C.
If you have expenses that don't fit into the listing in Part II, collect the other expenses and include them in the list in Part V. Also, consider the Form 8829 if you have a home-based business and want to calculate the home-based business space deduction. But don't forget self-employment tax. In addition to filing a small business tax return on Schedule C, you must also report and pay self-employment tax (Social Security and Medicare tax) on the net income of your business. Self-employment tax is calculated on Schedule SE and paid by the business owner, along with income taxes on other income. Because the self-employment tax is calculated based on your business net income, if you did not make a profit for the year, no self-employment tax is due. But, you must still complete Schedule SE to show your calculation. As a self-employed business, you can expense the portion of the self-employment tax that applies to your business rather than personal expenses. Add Schedule C information on Form 1040 where required. Beginning with 2018 taxes, enter the information from Schedule C in Schedule 1, Line 12, of your personal tax return. If you are using tax software, it will guide you through this step. Review these common tax return errors to be sure your return is completely accurate. The IRS will send it back to you if it has errors. In some cases, the IRS will catch simple math errors, but if you are getting a return, you don't want to delay it by having your tax return returned. If you are using tax software or a tax preparer, you can use E-File if your situation allows. If not, you will have to mail the return to the IRS. Make sure your return is received on time, according to IRS requirements for receipt of tax returns. Should I Get a Tax Preparer for Schedule C? If you have a very simple business without inventory, you might be able to prepare your own Schedule C, or you might be able to use a tax software program. If you have any unusual business expenses, or if your form is more complicated (including business mileage, cost of goods sold, or home-based business), you should probably consider using a tax preparer for your business taxes.